This good-value hotel’s traditional style creates a charming character and a cost-effective base in the city centre. This has been a popular and well-loved hotel for many years and renovations have been scheduled for 2014. 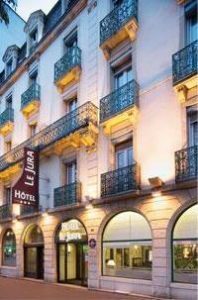 Located just 200 metres from Dijon station, the hotel’s location is ideal. Just a short walk away is an extensive range of shops, boutiques and restaurants. The City Centre location means that there are plenty of Bars nearby for those who like to explore a City’s nightlife. The hotel’s traditional style creates a charming character, and the bar and public areas are warm, well-maintained and rustic. The entire hotel is non-smoking and there is free wireless internet access throughout. For corporate groups, congress and meeting rooms are available. The hotel’s 76 rooms are large and airy, decorated with floral fabrics and light-wood furnishings. Each cosy room offers wireless internet access, and a balcony or terrace, individually controlled air conditioning, a flat-screen TV with Cable, telephone, safe, mini-bar and en suite bathroom facilities.